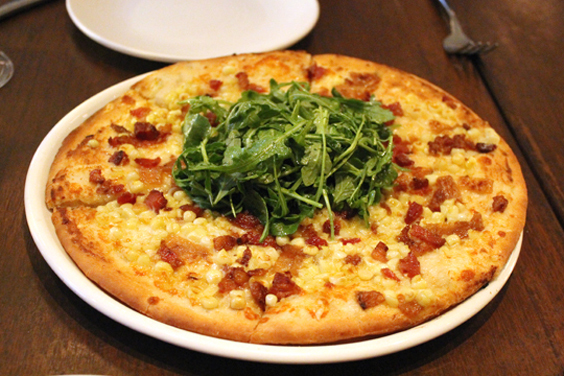 For the gluten-free pizza, I chose the “Sweet Corn, Bacon, Arugula, Basil” ($16.75). Unlike the other pizzas that arrive on a wood board, this one comes on a round plate. 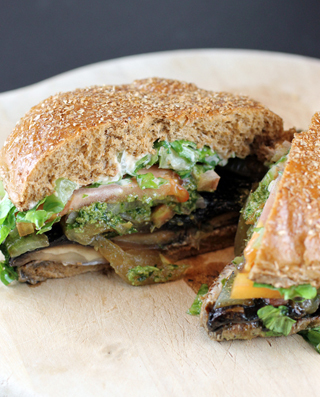 It doesn’t have the hills and divots of the regular crust that provide both crispness and chewiness. Instead, the gluten-free crust is fairly consistent in texture. But that’s not a bad thing because it’s all crunch. This is a sturdy crust that is amazingly crisp. The gluten-free dough is made by Oakland’s gluten-free Mariposa Baking Company, according to Pizza Antica’s specifications. Instead of wheat flour, it uses tapioca flour, organic brown rice flour, potato starch, organic amaranth flour and beet fiber. The vibrant topping was perfect with the sweetness of the corn playing off the saltiness of bacon, and peppery bite of arugula and fresh lilt of basil. I don’t know if it was just my imagination, but the gluten-free pizza definitely didn’t seem to sit as heavily in my stomach as a wheat-flour crust typically does. 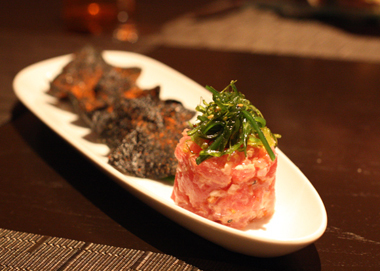 It still provides plenty of satiation, but somehow in a lighter way. If you haven’t been to Pizza Antica in awhile, you might not even realize this Italian eatery now has a very American fried chicken on the menu. 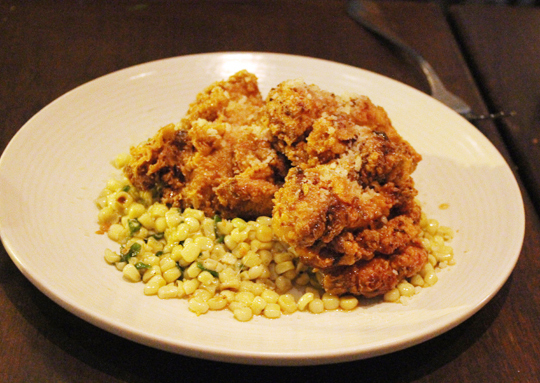 Sure, it’s called “Tuscan Fried Chicken” ($16). Maybe because of the Grana Padano grated over the mound of sweet corn kernels and green onions underneath the chicken. But I dunno — the honey drizzled over the fried chicken sure makes me think of the American South. The chicken is fried beautifully and the white meat is plenty juicy. You do have to like your chicken sweet, though, to enjoy this honey-accented version. Or just ask for it without. 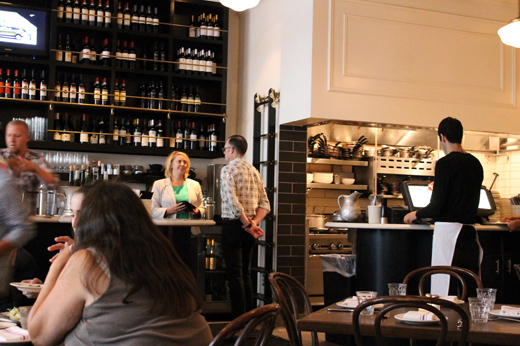 Pizza Antica also makes all its own pasta. 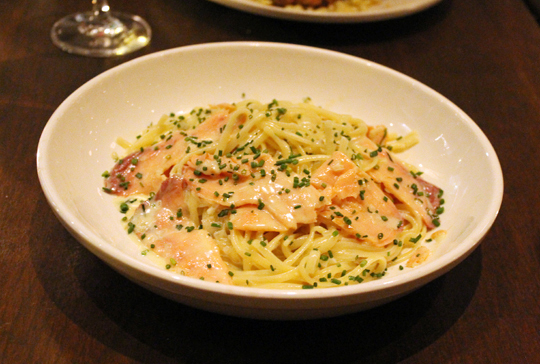 That’s evident in the “Linguine Rustichella d’Abruzzo with Smoked Salmon, Tarragon” ($17.75). The supple strands are barely coated in a light creamy sauce and tossed with big slices of fish that give a richness and smokiness to the whole dish. 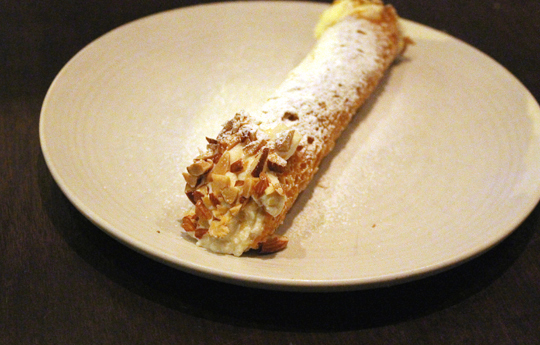 For dessert, there was cannoli ($3.75). The pastry shell was crisp, but a little bland. Maybe a dash of vanilla or almond extract would have pepped it up more. But the filling was delicious with Bellwether Farms ricotta mixed with orange zest and toasted almonds. 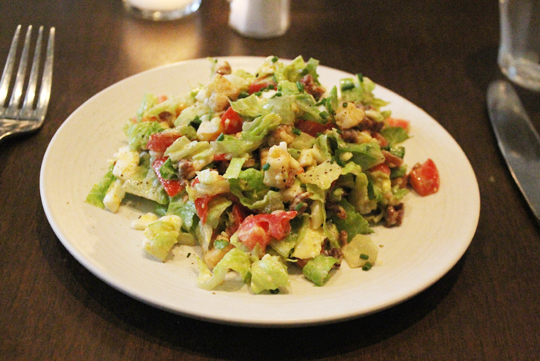 I’ve dined at Pizza Antica many times, and it never ceases to satisfy each and every time.